Pictured is Oklahoma State University President Burns Hargis, State Senator Tom Dugger, State Senator Eddie Fields and Northern Oklahoma College President Cheryl Evans. STILLWATER — Oklahoma State Sens. Tom Dugger and Eddie Fields are the recipients of the Oklahoma State Regents for Higher Education 2018 Distinguished Service Award. The award is given each year to individuals who demonstrate exceptional leadership and support to higher education during the Oklahoma legislative session. Dugger was recognized for his commitment to the state’s investment in higher education and to funding for the concurrent enrollment program through his work on the Oklahoma State Senate Appropriations Committee, Appropriations subcommittees on education and finance, and Education and Public Safety committees. He was elected to the Oklahoma State Senate in 2016 and represents Payne County. Fields was honored for his advocacy work to ensure higher education is a top priority in Oklahoma. He has played an instrumental role by advocating for an increase in concurrent enrollment funding. He serves as vice chair of Appropriations, chair of the Appropriations subcommittee on natural resources, vice chair of Energy, chair of Rules, and on the Agriculture and Wildlife and Education committees. He served in the Oklahoma House of Representatives from 2008-2010 and was elected and has served in the Oklahoma State Senate since 2010. He represents both Kay and Osage counties. 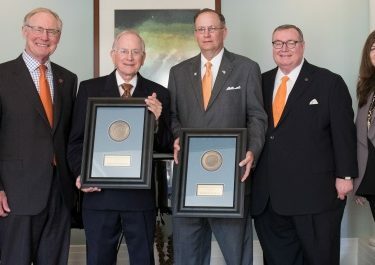 The two senators received the awards during a presentation Wednesday, Sept. 26, at the Atherton Hotel on the campus of Oklahoma State University. Both are OSU graduates.